One of the wonderful and unique characteristics that we love about cats, different from dogs, is that they take themselves to the bathroom. You simply leave a box with clean cat litter in it, in a bathroom or other easily accessible area of your home, and they go when they need to go. Cats are by nature creatures of habit and prefer continuity, so we recommend that for the first few days new cat adopters try to use the same litter that was being used in the shelter you adopted from or from their previous home. Once your feline friend is comfortable in their new home you can feel free to transition them to other types and varieties of litter, as you like. Of course, when you walk down the litter aisle to pick up some cat litter, there are so many different brands and varieties to choose from its mind-boggling! How on earth do you know which type of litter to get, and most importantly what will your kitty use? There are distinct differences between the various types of cat litter that we'll review to help you find the best option for you, your home and most importantly for your new cat or kitten. Whatever cat litter you choose to try, we recommend that you gradually transition your kitty to the new product. If they won’t “go” in it, then revert to the previous product or try something else. This is by far the most popular type of cat litter on the market. Clumping clay litter is highly absorbent and “clumps” together when it gets wet. Its clumping property enables you to remove virtually all of the urine and solid waste left behind by your kitty, making it the most odor-friendly and extremely easy for you to use. It comes in scented or non-scented varieties. Clumping clay litter does cost more on a per pound basis, but that is balanced by its unique user-friendly clumping capability. This is the second most popular type of cat litter purchased. Non-clumping clay litters are less expensive per pound, but are less effective in masking odor than clumping clay litter and are a bit more work to keep the litter box clean. Most of the time this type of litter is used by shelters since it’s lower in cost and they may be changing litter boxes multiple times a day. Since urine doesn’t completely clump with traditional clay litter, cat owners must discard the entire contents of the litter box when it becomes saturated, instead of just scooping out fully clumped balls of urine or solid waste. For the ecologically-minded there are environmentally-friendly cat litters made from natural recycled wood and paper. They begin as a hard “pellet” and as they absorb cat urine in the box, they breakdown into a congealed powder that can be scooped from the cat box similar to clumping litters. Besides being completely biodegradable and compostable, they are lighter in weight than clay products so are easy to handle, are virtually dust-free, track far less and have odor-masking qualities just like other litter products. Also for the eco-minded, this type of litter can be made from milled cob corn, whole kernel corn, wheat or other vegetable-based materials and is one of the more natural types of cat litter. These litter products are available in a clumping or non-clumping form, are biodegradable, compostable, and home-friendly in that they are by nature low-dust and low-tracking. Crystal cat litter is made of silica gels that efficiently absorb cat urine. This type of litter helps to control the odor and often doesn't track out of the litter box as easily as clay litters, making cleanup easier. This type of litter needs to be changed once the crystals have reached their absorption capacity and the cat urine has started to puddle. The silica gel crystals can be harmful to your cat if ingested, so it's important to ensure they're not tracking crystals out onto their paws and then cleaning them. One of the downsides of clumping litter is that it's extremely heavy to cart around. (Ever tried picking up a 40lb. carton of kitty litter at the store before? It's no easy feat!) A newer type of cat litter is lightweight natural clay litter, which can be up to 50% lighter in weight than regular clumping or non-clumping clay litters. The lightweight litter granules are larger than regular clumping cat litter, but still have all of the great features of both clumping and scented litter in a handy lightweight form. Lightweight may be the right weight for you, but its main attribute can be heavier on your wallet and can be a bit dustier than other litter products. Most non-clumping clay and clumping clay litter brands are available in scented or non-scented varieties. Scented litter is popular because it helps to neutralize the odor of cat urine and solid waste and limits odor from seeping into other rooms in your home. As long as you regularly clean out your cat's litter box droppings, you shouldn't have an odor issue, but using scented litter can help even more. Be aware that some cats may not like the scent that’s pleasant to your nose, or can even be allergic to scents added to litter. 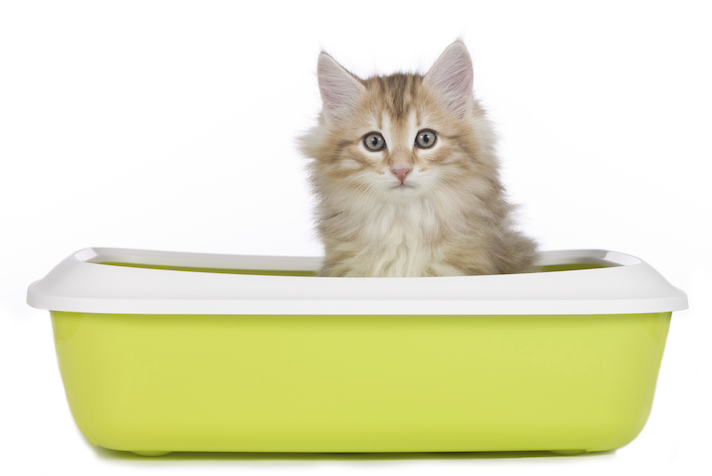 These are the six most popular types of cat litter. Each has its own pros and cons, and it's important to decide what you think will work best for you as the cat owner, and most importantly for your cat!